The agri-food sector, particularly livestock, plays an important role in the economy, livelihoods and nutritional security of Vietnamese people. Regular consumption of pork makes it an integral part of Vietnam’s diverse and rich culinary tradition. Typically eaten daily with steamed rice and vegetables, pork is an affordable as well as favourite protein source, accounting for 40% of household expenditure and 75% of the meat consumed. More than 83% of pork is produced by small-scale farmers and sold in traditional fresh-food markets, and 65% of rural households depend on pig farming for their livelihoods. Rising urbanization and a growing middle class have driven changes in dietary patterns, leading to increased pork consumption. In recent years, the Vietnamese government has acknowledged scope for evidence-based decision making in reducing the prevalence of food-borne disease in traditional markets. Improved safety in the food supply chain has the potential not only to protect the health and welfare of poor livestock producers, sellers and consumers, but also to grow the economy through the increased competitiveness of Vietnam’s food products and the opening of premium markets. Conversely, food safety hazards— or perceptions thereof—impose a significant economic burden, impeding value chain development and exports. In 2013, scientists at the International Livestock Research Institute (ILRI) teamed up with national and international partners to establish the Vietnamese National Taskforce of Food Safety Risk Assessment. The taskforce conducted a series of cutting-edge studies on risk assessment and the cost of illness and, based on the findings, developed guidelines and support materials to enhance food safety in pork value chains. These materials have been used in assisting key ministry officials and researchers to bring risk-based approaches to food safety management. 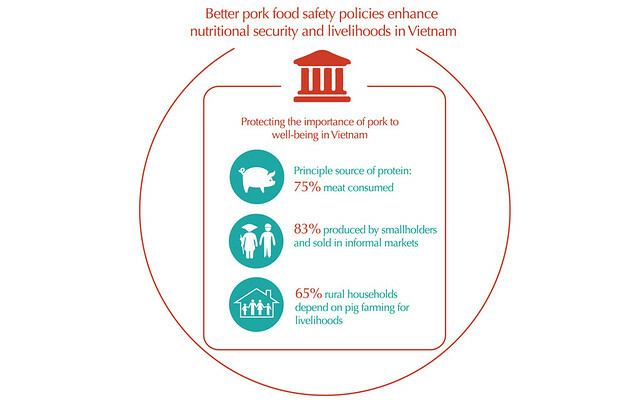 For instance, national researchers have used the materials and ILRI training to undertake risk assessment of food safety in pig value chains in Vietnam and provide training to national and regional counterparts. After establishing a track record of providing timely evidence-based pro-poor policy proposals on food safety to the authorities, ILRI was invited to join the nascent Vietnam Food Safety Working Group in 2015. The initiative, led by the Food and Agriculture Organization of the United Nations (FAO), was set up to bring together government agencies and international development partners to share knowledge and support policymaking in the country. Two years on, Vietnam’s government is responding with changes in food safety policy—moving from an inspection-and- enforcement approach to a risk-based inspection and monitoring system bolstered by compliance incentives. With the publication of a comprehensive report by the working group—Food safety risk management in Vietnam: Challenges and opportunities—the government has committed to implement measures to improve risk assessment, communications and management and the surveillance of food-borne diseases. The Hanoi, Ho Chi Minh and Hai Phong city authorities have begun developing plans to implement the report’s recommendations. According to the World Health Organization, measures reducing the impact of food-borne diseases could save the Vietnamese economy up to USD1 billion a year due to improved production, health and related market efficiencies. ILRI-led research found that improved food handling and cooking practices could save up to USD6 million in reduced pork Salmonella-related hospitalization costs alone. Tags: ILRI outcomes. Bookmark the permalink.